The EF5 tornado that swept across Moore, Oklahoma, on Monday, May 20, left a trail of utter devastation in its wake. Quick to form and quick (relatively speaking) to dissipate, a tornado is the essence of unpredictability and violence. Recovery operations began immediately in Moore, focused on the rubble that minutes earlier had been an elementary school. As the initial shock gave way to grim purpose, a troubling question arose: why was there no storm shelter here? In hindsight, it is easy to agree that there are certain places and times where prudence dictates preparation for protection from weather and war. The same question loomed as I researched the historical background for Building for War. 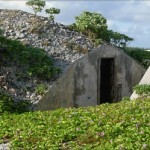 The construction of naval air bases and facilities at Wake Island, Midway, and half a dozen other strategic Pacific locations was predicated on war with Japan. It was not a matter of if, but when. As the months of 1941 raced by, relations with Japan deteriorated and the likelihood of imminent war increased. The navy pressed for speedy construction on the outlying islands (though, as my book demonstrates, it undermined its own imperative with lengthy delays in plans and approvals). The region of Oklahoma where the tornado struck on May 20 is “ideally” situated for the formation of destructive weather patterns. Indeed, devastating tornadoes had swept over the small town of Moore twice before in the last fourteen years. The most powerful winds ever clocked were recorded there in 1999. The geographical conditions required for tornado formation are there: throw in timing, humidity and wind shear, and bad luck and it is not a matter of if, but when. Unfortunately, geographical conditions for underground storm shelters or even basements are not there, given the porous quality of the soil. Construction of above ground “safe rooms,” concrete structures built to FEMA standards, is hampered by the high cost. For large public structures the budget item is enormous and school budgets are always contentious. There was no safe room in Plaza Towers Elementary School on Monday when the tornado struck, but early warning got many out of the storm’s path or into sufficient shelter elsewhere, and those who remained literally hung on for dear life.